This is the Ambient-geared side-project of Ethan Matthews, guitarist and producer of Progressive Rock outfit Greyhaven, originally set up in Boston during 2000 as a Progressive Rock recording duo including Greyhaven keyboardist Matthew Cahoon on vocals. This duo produced two untitled EPs which looked different only thanks to their black and white covers (later, the EPs would become known as The Black and The White), and which would serve solely as a means to get gigs for the live band, which also comprised bass/ Warr guitar player Kai Kurasawa and drummer Michael Van dyne. Several shows were played in the Boston area, but during 2001 Ethan suffered several mental and emotional breakdowns, partly due to the musical and personal differences within the band, and which first led to the band's demise in late 2001, then eventually to Matthew spending time at Boston Mass General's mental ward to recuperate. Ethan moved back to Portland, Oregon (where he'd spent part of his youth) in 2003, and keeping the Echo Us name, started work on finishing Echo Us' debut full-length, eventually releasing the self-titled album on his own label Absolute Probability Recordings in February 2005. Although still displaying bass played by the band's original live bassist, Kai Kurasawa, the material had however undergone a complete shift to a more experimental and ambient sound. A further refining of that sound came with 2009's The Tide Decides, which was officially released through French specialist label Musea Records. A 70-minute conceptual work, The Tide Decides featured guest musicians Raelyn Olson on harp, Teri Untalen on viola, Aaron Bell on bass, and Andrew Green on the drums. Alongside the recording work on The Tide Decides, Ethan began the compositional stage on this follow-up album, thus effectively starting a multi-album conceptual work. And, as on its predecessor, Tomorrow Will Tell The Story sees the use of a couple of guest musicians, with again Raelyn Olson on harp, Henta on additional (female) vocals, Rawn Clark performing a Kabbalistic 'canticle', and one Daniel Panasenko playing some harmonium. Stylistically speaking, the album has an overall calm feel, even though occasional short electric guitar passages will liven up the pace somewhat. But overall, the guitar remains either acoustic, or played with almost no distortion. Expect a lot of keyboards, both as piano and as more atmospheric organ/synth-like, and of course the delightful additions of that harp and harmonium here and there...but, in the first place, this album is a masterpiece in the vocal department! Not only is vocoder used frequently to alter the vocal pitch, but they also come frequently in layers and, to create even more “vocals”, the keyboards are frequently played in a mode to emulate choral singing. Somehow, what with the strange language being sung/ chanted, there's ethnic influences in the whole, but darn me, I couldn't tell you which ones! To make the vocal soundscape even more complicated, Ethan incorporated several spoken word samples (is that Carl Sagan I hear at one particular moment?). Great stuff, and quite frankly, this album stopped me right in my tracks for a couple of days. Nah...not a good thing, such masterpiece albums such as this, for one tends to linger onto them much longer than is actually good for the continuation of one's work as a music journalist! No good, when yours truly finally found a fresh wind to continue working on a backlog of albums still waiting to be reviewed! Hahah...but I must admit having thoroughly enjoyed every minute and hour (in fact, one hour and almost 5 minutes per session!!!) I spent with Tomorrow Will Tell The Story! Yeah, while listening to the album over and over again, I took out some sneaky time to work on a backlog I had garnered in my work as an amateur paleontologist. And so, things turn out well after all! But enough of that...you don't wanna hear, say read, about my personal troubles, you wanna know more about where you can listen to music by this very fine artist, right? Well, just surf to (www.) 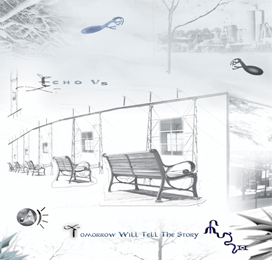 myspace.com/echous, where you'll find the one track “Anchors Away” off the new album (the other 3 tracks coming off the previous albums, and a Fall 2005 interview with Ethan to boot!). You can find some extra (older) tracks in the “Media” section at (www.) echous.net. A follow-up on the album, and the closure of the conceptual trilogy, has already been worked on, and should've been in completion stages at the end of 2012. In other words, I hope to be able to review a new Echo Us album soon enough. As to my not giving Tomorrow Will Tell The Story a perfect 100%, that's because I'm gonna have to move hell and high water to get a copy of all of Echo Us' albums. I mean, I want to add those albums to my collection really badly, and I guess I'll have to write to the artist myself (I don't even get to keep the copy of the album I just reviewed, as I have an agreement about that with my editor-in-chief concerning all TSM stuff! By the way, thanks goes to Nicky Baldrian for having put Echo Us onto us!). Say, if you were to question me as to what exactly my favourite album of last year may have been, I would normally not be able to answer that without giving a list, but I can tell you that for stuff having been released during 2012, there's now Tomorrow Will Tell The Story settled well in the top!